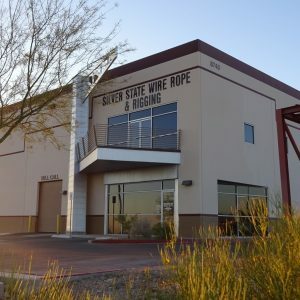 The main Silver State Wire Rope and Rigging facility is where our passion for providing wire rope products and solutions all started. Beyond the wire rope suppliers and manufacturers, we offer training classes on how to safely install wire rope and go over important guidelines and regulations. We are proud to have recently opened one of our newest wire rope facilities in Elko, where many of our mining and utility industry customers are. Our new Elko location is a continuation of the same great, safety-first services and products we have offered since the day our Vegas location opened its doors. When you’re working in an industry like entertainment, mining, or utility, safety is of the utmost importance when choosing your wire rope products. You have to choose your wire rope manufacturers and suppliers carefully, and our professional facilities prove we are a passionate and safety-driven wire rope company. Though separated by over 400 miles of Nevada roads, both of our wire rope facilities deliver the Silver State Wire Rope and Rigging mission professionally and safely to all of our customers in their industries. Our training facility, which respects this same mission, is like no other you will find at another wire rope company. No matter the job, our facilities have everything to fulfill your wire rope needs. Above all, safety is the most important element of handling wire rope. Our experienced suppliers know what’s best for your needs so every job site is secure and follows regulations. Contact Silver State Wire Rope and Rigging today so we can help you get the job done with safety in mind first.